http://www.sfgate.com/bayarea/article/Dinosaurs-have-the-last-word-in-S-F-exhibition-2489217.php — Could that be it in the glass box there? Interesting, ech. I hope David will drop by to confirm or deny. Hmm, possibly not. 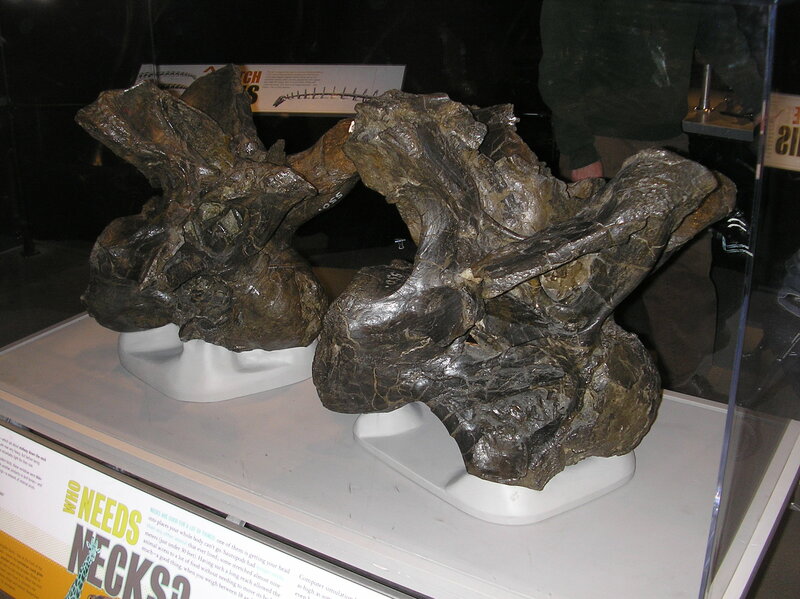 The exhibit in the photo that ech found is evidently the same one in this Flickr photo, from which we can see the the glass box contains two Apatosaurus cervicals but both are mjssing their cervical ribs. This other photo from the same stream shows the vertebrae in close-up. It’s not obvious how they could have inspired the Umbaran Starfighter. This was a traveling exhibit put together by the American Museum of Natural history. This is from when it was at the temporary California Academy of Sciences in San Fransisco. It was an extensive exhibit discussing all the new discoveries made in the last decade. 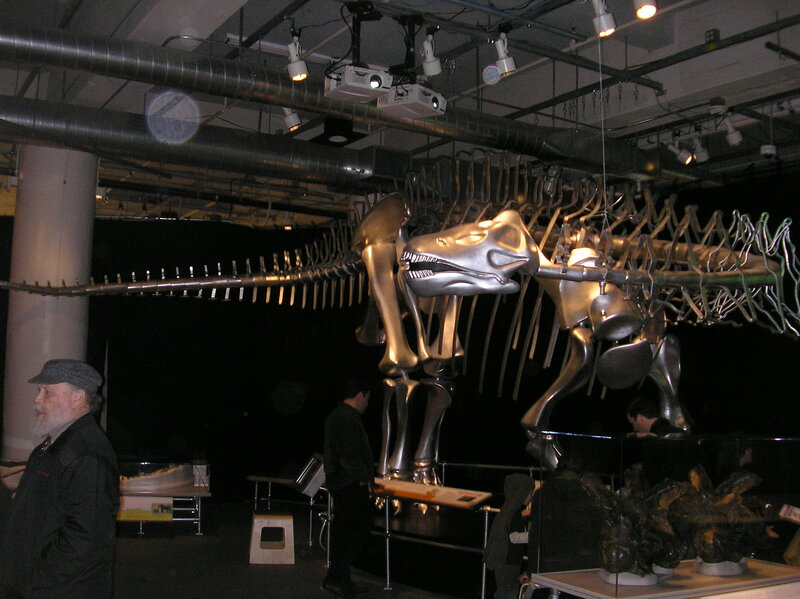 It talked about theropod and sauropod biomechanics, display and defense, extinction theory, and ended with a spectacular diorama of Liaoning Province, China, during the mid- Cretaceous period. Its kind of sad that the original pictures of this specimen were taken at the California Academy of Sciences, seeing as the museum essentially got rid of all their public paleontology displays with the exception of a cast T. rex skeleton. 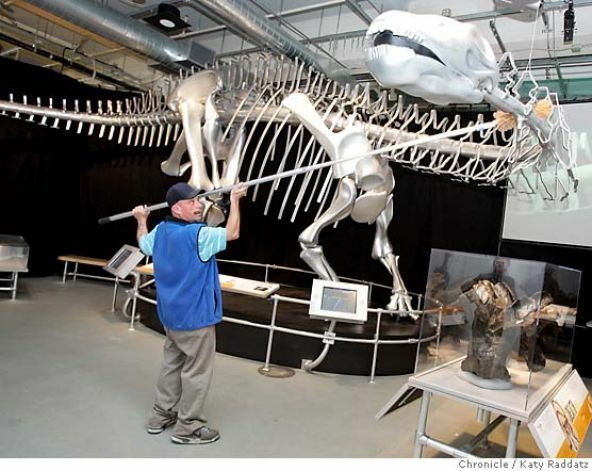 There are very few good paleontology museums open to the public in north and north-central California, so if you want to see any fossils in that region you would have to trek all the way up to Rocklin and hope that the museum there is open. One wonders if the starfighters could interlock; and if so, if they did, what shapes they could make. Were they limited to the horizontal generally, or jutted out at a 45° angle… hmmm. Food for thought. I’m nowhere near astute enough to recognise any particular species or specimen in the prosthetics, but given how convoluted some Klingon heads were, ‘sauropods’ sprang to mind. Am I completely wrong, or just a bit wrong? Wow! I have no idea about this! Great spot, Warren! I have to admit I am not super-clear on how those midline-symmetric features are based on vertebrae, but I’m prepared to believe it from the horse’s mouth. That. Is. Awesome! I am promoting this to a post of its own, with full credit to you, Warren, for bringing it to our attention. How cool!